Yamaha Motor India currently retails 14 motorcycles in the country. The range starts from INR 47,700 for the Saluto RX while the top spec Yamaha YZF-R1M costs INR 33,54,300. Prices mentioned here are ex-showroom Delhi. This huge difference between the most affordable and expensive machine is bridged by 10 locally manufactured motorcycles and few other CKD as well as CBU models. Yamaha offers engines ranging from 110cc to 1679cc while its power values range between 7.4 BHP to 197 BHP. 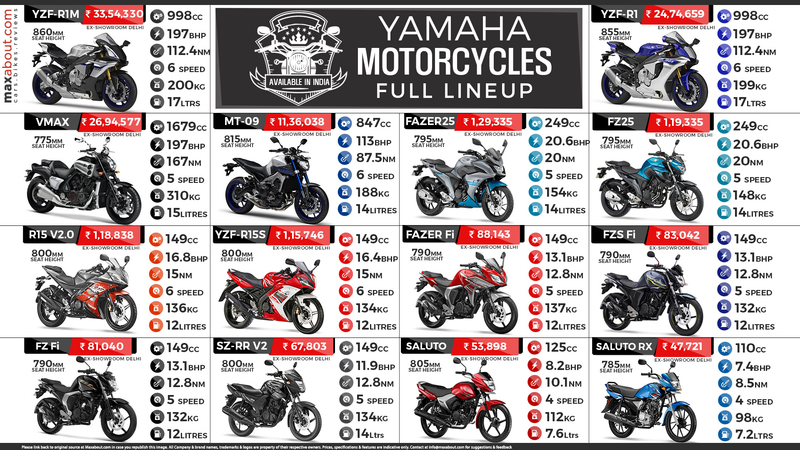 The most selling products in the lineup includes Yamaha R15 and FZ series. Yamaha is the only manufacturer that offers fuel injection in its entry level FZ model that costs INR 81,000. The engine powering the famous Yamaha R15 is good for 16.8 BHP and 15 Nm of torque. It comes mated to a 6-speed gearbox. The motorcycle leads in the performance 150cc segment with around 12 second 0-100 kmph sprint and most effective body design. Yamaha motorcycles mainly compete against Suzuki, Honda and Kawasaki products while their entry level options rival Indian brands like Hero, TVS and Bajaj Auto. Yamaha's entry level Saluto RX weighs just 98 kg, making it very effective against any other bike in its price tag.